The Breakthrough Prize gala scheduled for Sunday, Nov. 8, in Silicon Valley is invitation-only, but a full day of symposia and panel discussions in Berkeley on Monday, Nov. 9, are free and open to anyone interested in the hottest topics in the life sciences, physics and mathematics. 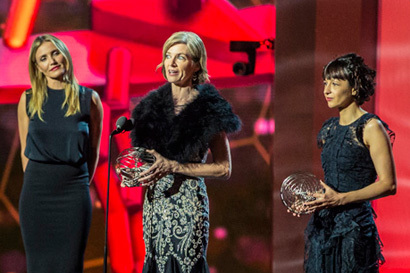 At last year’s Breakthrough Prize gala, Berkeley’s Jennifer Doudna (center) and colleague Emmanuelle Charpentier received a life sciences prize from actress Cameron Diaz. All day symposia at the Brower Center begin at 10:30 a.m. and will delve into how the human brain operates, the genetic origins of disease, the future of particle physics and the newest developments in mathematics. The talks, many of which are meant for students and scientists in these fields, are presented in partnership with Scientific American and will be streamed live for those unable to attend. At Sunday’s gala, which will be broadcast live on the National Geographic Channel, actor, writer and director Seth McFarlane will join Hollywood stars Russell Crowe and Hilary Swank to announce the newest prize winners, recipients of the 2016 Breakthrough Prizes in fundamental physics, life sciences and mathematics. Several of the new prize winners will talk at the daylong symposia at the Brower Center. Monday ends with a 5:30-7 p.m. panel discussion in Zellerbach Playhouse, with leaders in physics, mathematics and the life sciences in conversation with entrepreneur and investor Yuri Milner. The three topics for discussion are: How does the human brain work? What are the origins of life? and Why is the universe comprehensible? Panelists include current and past winners of the $3 million Breakthrough prizes, including UC Berkeley physics Nobelist Saul Perlmutter and biochemist Jennifer Doudna. Though free and open to the public, those planning to attend should reserve a spot at http://breakthroughprize.berkeley.edu/registration. Tickets also will be available at the door. The Breakthrough Prize was founded by Google co-founder Sergey Brin and his wife, Anne Wojcicki, a founder of the genetics company 23andMe; Alibaba Group founder Jack Ma and his wife, Cathy Zhang; Russian entrepreneur and venture capitalist Yuri Milner and his wife, Julia; and Facebook founder Mark Zuckerberg and his wife, Priscilla Chan. The prizes aim to celebrate scientists and generate excitement about the pursuit of science as a career. Breakthrough prizes are funded by a grant from Sergey Brin and Anne Wojcicki’s foundation, the Brin Wojcicki Foundation; a grant from Mark Zuckerberg’s fund at the Silicon Valley Community Foundation; a grant from the Jack Ma Foundation; and a grant from the Milner Foundation. For more information, link to the Breakthrough Prize website and the symposium website.